A comprehensive guide to integrate your Android app with AppVirality’s Android SDK. The new SDK v2.0 for Android now enables you to run a Loyalty program in tandem with your In App Referrals. If that wasn’t good news enough, the SDK v2.0 has been improved on all fronts – thus making it leaner, sharper and way more seamless in the integration. Going forward, we shall be denoting the invitation or referral sender as ‘Referrer‘ and the receiver or beneficiary as ‘Friend‘. The integration is very straightforward. Copy AppVirality SDK Jar to the libs folder of your application, and then add it as a file dependency for the application module. Use Gradle dependency for SDK , If you want to build your own UI. Add the following line to your app-level build.gradle. Use Gradle dependency for SDK + UI , If you want to use default UI with basic customization like colors and background images. Add the following line to your app-level build.gradle. If you want to completely customize the default UI, please download the AppViralityUI library project and edit the xml layouts by following UI customization help guide. Our solution encompasses all needs that seem to affect mobile growth executives. It comprises of a SDK and a UI to help you execute the most effective growth campaigns almost instantly. The SDK consists of all the resources needed for the AppVirality solution to execute, track and deliver analytic data (events, coupon, user profile, etc.). The UI component is a vibrant UI patch that provides ready-to-use visual & UI elements necessary for your app campaign’s activity like the In-App Referral’s Share Intent Screen. However, as a preemptive measure, for apps that would rather execute their own UI schema for such screens – we have encapsulated the UI component as an optional resource. This allows them to integrate the SDK only, without the UI. 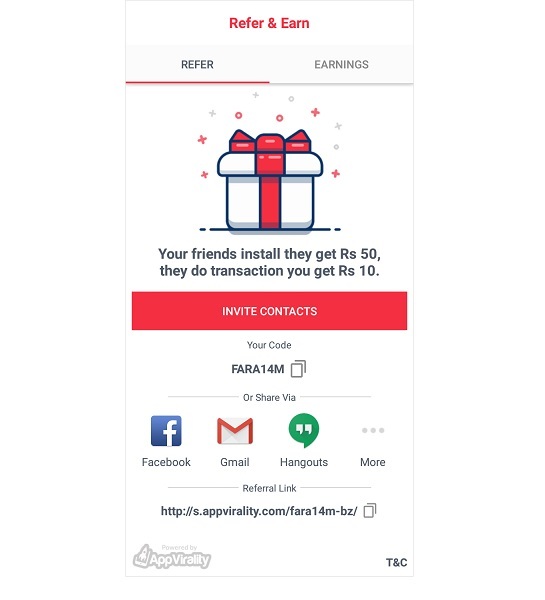 If you have registered your iOS Application already and want to run the same referral campaign on Android App as well, do not register the app on AppVirality again, separately. Use the same App Key obtained from the initial registration. Add the following sub-elements to the manifest element of your AndroidManifest.xml. Set value as true or false, depending on whether you want to run the app in Test Mode or Live Mode respectively. Test Mode allows you to add Test Devices in AppVirality Dashboard. You can reset test devices from dashboard, enabling them to be reused as a fresh device again. For more on how to add test devices visit. Ensure that you reset the value as false before publishing the APP to the Play Store. Failing to do this will make only a Test App to be uploaded. Add the following permissions to your AndroidManifest.xml. Add the following code block if you don’t have an INSTALL_REFERRER receiver in your manifest. Declare following activities if you are using AppViralityUI dependency. With GrowthHackActivity.java, you must either use AppViralityTheme as the theme or create a new style extending AppViralityTheme as its parent, modifying the style attributes values as per your requirements and then use this theme. Copy the following style in your styles.xml to create a NoActionBar theme. For posting campaign image with the invite message on some social networks, you need to share the image with the corresponding social network app. As Google recommends using Content URI, you need to declare the same in your app for sharing the image’s Content URI with such social network apps. To do so follow the below two steps. Create file provider_paths.xml under App -> res -> xml folder and declare the path inside it where you are storing your campaign images. If you are using AppViralityUI module or storing images in external storage you can use the below code else please check out this link to find the proper declaration for your storage directory. Now declare the above created provider paths file in your application manifest. To do so please copy the below code in your application manifest under <application></application> element. Before actually initializing the SDK we need to create the AppVirality class singleton, which is the main class in the SDK – needed for various SDK operations. Create AppVirality class singleton in the onCreate method of either your app’s Application class or the launcher activity. Use the below method if you want to instantiate the SDK with default configuration. Use the below method if you want to configure any properties for the SDK using Config class. Use the same above method to retrieve the already initialized singleton throughout your application. Setting/Updating the users’ details is an important step. This is how AppVirality would be aware of the identity of a business user as classified by your app. This is important and impacts things like: personalizing the referral messages, welcome screen – shown to new users on the 1st session/open post app installation. Step 1 Create a UserDetails class object and set the various user details to recognize the user same as your back-end system. email(Required) User's email address or mobile number or unique Id. This is used as primary to identify user. Set setExistingUser property as TRUE only on first App launch i.e. only once. On subsequent launches please don’t set this property. At any point of time, excluding the first time, if you set this property to TRUE all the existing user rewards will be set to Rejected state and would also stop reward on future events. Use this property carefully and with caution! Step 2 Invoke init(UserDetails userDetails, AppViralitySessionInitListener callback) method of the AppVirality class to start the AppVirality’s initialization API calls, passing the UserDetail object created in the previous step and an AppViralitySessionInitListener instance. Once the SDK has been initialized do not use this method to update the user details as it won’t work for that, instead use updateAppUserInfo method if required. It is advised that you INITIALIZE the SDK in the Login Screen, so that we may ensure a smooth user experience. This helps ready your campaigns in the background while your app loads all its resources. // whenever a new session is started using this callback. For more details on above mentioned callback’s responseData view. Make sure to invoke the init() method on every app launch, if the SDK has been initialized, which you can check by calling isSessionInitialized() method of the AppVirality class, which would return True if the SDK has got initialized else False. Please ensure you are doing so with the user details you get during Signup/Login. Launching the Growth Hack is something which can really vary from app to app, and be hugely dependent on the use case & flow of the app. This is a very big reason why we see a new type of growth hack launch for every new app. Launch from custom button i.e from Invite Friends or Refer & Earn button on your App menu, however show Button (i.e. Invite & Earn button) only upon campaign availability. You can control the behaviour of your Growth Hack button, i.e. 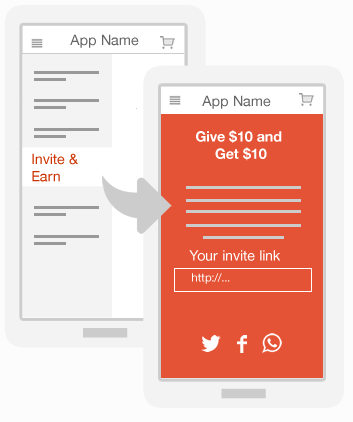 Invite & Earn button – by checking for the campaign’s state & thus controlling the Growth Hack launch. You can use the following method if you want to show some label or message bar, only if there is any campaign available for the user. CampaignDetailsListener will get called irrespective of campaign availability; but if campaign is not available the onGetCampaignDetails method shall receive an empty campaign list. This is mainly useful when you want to have some control over the “Invite” or “Share” button visibility. * Download and save WOM campaign images. //If not using the AppViralityUI dependency copy the Utils class (https://github.com/appvirality/AppVirality-Android-SDK-2.0/blob/master/AppViralityUI/src/main/java/com/appvirality/appviralityui/Utils.java#L285-L301) and call the method "refreshImages()"
You must check for refreshImages value and download the images for the campaign if its true, whenever you use the CampaignDetailsListener callback. This is imperative because this value will be provided only once, whenever campaign data will change. So in order to have latest campaign images you must check refreshImages value each time you use this callback. You can try out other methods available for introducing the growth Hack to the users. Regardless of whichever button or event you would use to trigger the Launch of the In App referral Growth Hack screen, the empirical format to approach it would resemble the following code block. This is applicable only if you are using the AppViralityUI component. 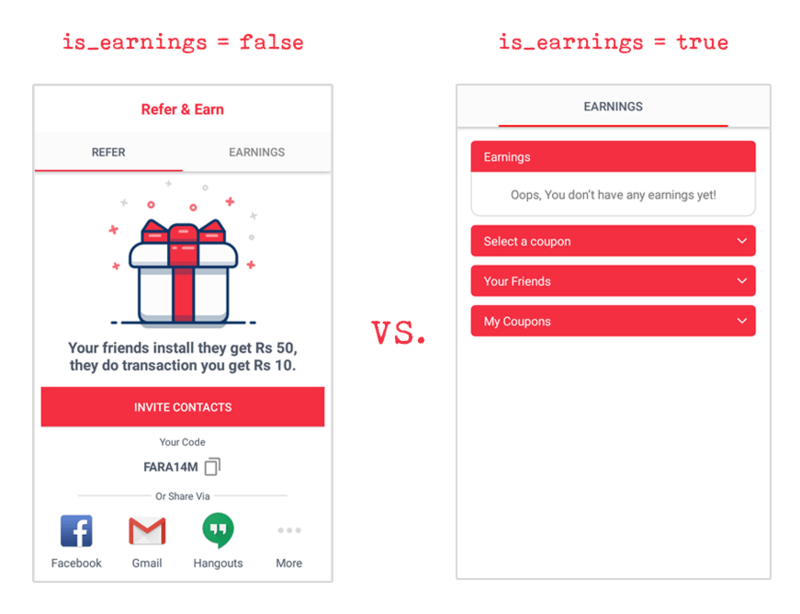 campaign_details and is_earnings are Intent extras that help in defining how the Growth Hack screen shall be displayed/rendered. campaign_details is indexed to the CampaignDetails class object being passed, which is where the bulk of the Campaign data for the user is available for use. is_earnings is indexed to a boolean value: which denotes if you want to show the entire Growth Hack screen (i.e. ‘Refer & Earn‘ along with ‘Earnings‘), or only the ‘Earnings‘ screen. Every campaign rule defined by you is designed and intended to kick in upon specific events. These events are user actions inside your app, which are critical to identifying that a user has onboarded successfully and hence is eligible for the reward. These events are triggered on actions like: Install, Sign-up, Transaction, and any other custom defined action suited to your app’s use case. Registering these events (thereby communicating the same to AppVirality) is an essential part of the process to reward your participants (Referrer/Friend) in case of a successful event. This also helps us tally and arrange specific analytics like LTV of a customer, etc. Please send conversion events from Server side using API Register Conversion Event and avoid using client side SDK callbacks “appVirality.saveConversionEvent()” to handle fraud/unwanted automated events. Please let us know once you have started sending conversion events from server side so that we stop honoring client side conversion events. Use this event to notify AppVirality of an install event. Upon every Transaction on your app by a user, you should notify AppVirality. This event is critical in measuring analytics like LTV, ROI, CAC/UAC, etc. A lot of app use-cases have custom events driven incentives. Example: ‘Make a file transfer to your friend‘, or ‘Complete Mission‘, or ‘Comment on a Post‘, etc. Please update user details before sending any conversion event. This will ensure that the correct user details will be used to send reward notification. Upon successful conversion, web-hook will get fired with the provide user details. If your app uses LogIn/LogOut feature, allowing multiple users to use the same device, you need to notify the same to the AppVirality SDK so that campaign and user related data should be cleared upon LogOut and hence enabling the device to be used by some other user. To know more about LogIn/LogOut use case click here. Starting with Android 9.0 (API level 28), cleartext support is disabled by default, which won’t allow to make HTTP calls with cleartext data. Also, your app might be using network security configuration to restrict cleartext HTTP traffic for domains other than yours. AppVirality SDK v2.0.10 onwards all the API calls are HTTPS based so you won’t need this step but if you are using any older version, you will have to create a network security configuration file, declaring cleartext HTTP traffic to be enabled for AppVirality. For more detail please check Network security configuration. If you use Proguard with your application, there are a set of rules that you will need to include to get AppVirality to work. AppVirality will not function correctly if Proguard obfuscates its classes. That concludes the integration process. Now it is time to sit back and watch AppVirality in action. Similar to the above case, there could be many instances of the User details being updated inside the app on multiple use cases.